It’s our city’s most social season and whether it leaves you looking for dinner after the track or a place to land after a long day of entertaining, we’ve found delicious options. 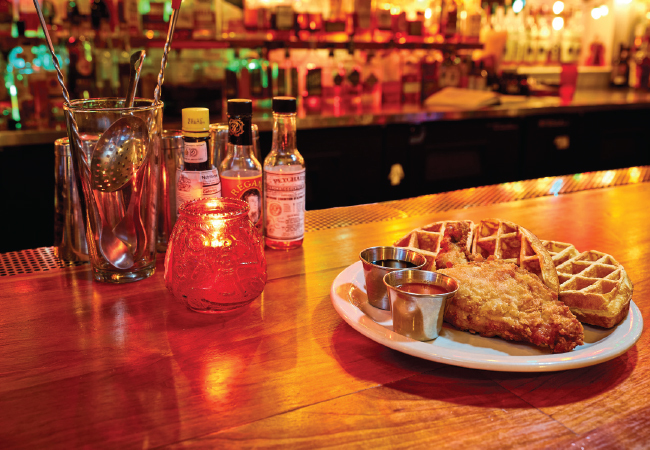 The Hub is one of Louisville’s go-to spots for late night dining and fun. First, the food. Clifton fried pickles are a sweet and spicy jump starter to the evening. Let them lead into popcorn, chicken wings (you’ll have your choice of three sauces), spinach and goat cheese dip, and burgers, one of which is vegetarian. The oh-my-let’s-get-a-second-order nachos can be paired with bourbon roasted pork, vegan chorizo or grilled chicken. At The Hub, you can build your own Shandy by choosing a flavor (black pepper ginger, tangerine vanilla, blueberry lavender), a liquor and a beer. But, if you’re not into building your own, the cocktail experts have you covered with stunners like Coco Fever, Wren Bird and Scarlet Lady. We’re not going to give you all the details because half the fun is discovering them for yourself. For a non-boozy night there are mock-tails such as Lemonade, Island Breeze and an Arnold Palmer 2.0. “The Hub is perfect for late night because they have a game room, patio and music. Everyone can find something they’re into. You can have some food and a quiet couple of cocktails, or you can be more active with a video machine, at the pool table, in the game room. And people seem to gravitate to the shuffleboard and Golden Tee,” says co-owner owner Talmage Collins. An outdoor dining area is outfitted with bleachers, booths, firepit and television. Galaxie is a cool NuLu hot spot where people who live or work in the neighborhood are gifted with a ten-percent discount. Kinda makes you want to get a gig in NuLu or call it your new home, doesn’t it? The front bar changes into a full dance floor with a DJ. Bar manager Lauren Conley says, “There are people wall-to-wall.” The Outer Space, open in spring and summer, has an additional bar, and will again kick off Derby weekend. “I feel like NuLu is still a bit of a destination-area but we have people from all over Louisville who come here. We’re open on weekends until 3 a.m., sometimes later if a party is still going, that’s a big plus,” she says. The 16-ounce house margarita, concocted with house made sour mix, is the best-selling cocktail. Its popularity may be attributed to its potency. Ask for fresh jalapeños to be shaken in for a spicy option. A blend of cayenne pepper and kosher salt rim the glass for an additional kick. Galaxie’s Wakamole and chips and queso are good choices if you’re in the mood to share. Other menu items that are late night hits are the cheese steak, spicy chorizo and Baja shrimp. The loaded Vader fries come with queso, rojo salsa, avocado crema, feta, pickled red onion and cilantro. “People often come to Galaxie to launch or finish the night. 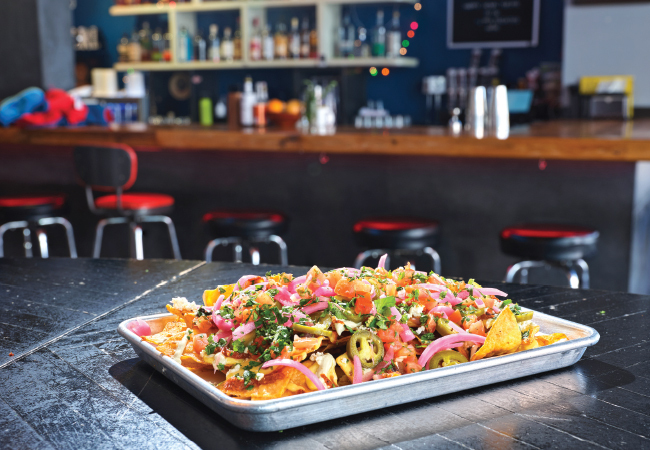 Our loaded nachos help coat your stomach for a night of drinking,” says Conley as a heads-up. Chef and owner Bobby Benjamin thinks of Butchertown Grocery as his dining room, but Lola, the intimate lounge upstairs, as his living room. Plenty of Lola lovers feel the same way about the cozy second floor ambiance that’s sometimes sparked with live music. “The whole idea of doing the bar was to have a neighborhood spot where you could come in and get a great drink for three dollars or ten or fifteen dollars, depending on what you felt like that evening. Organically, what happened was that the guests also wanted Butchertown Grocery food. I listened to them and decided how to make that happen,” he says. Late night Lola diners are able to enjoy anything on the Butchertown Grocery menu. We’ll leave it up to you as to what you should order, but you can easily vanquish the late night hungries with Chesapeake Bay oysters, tuna tartare, BBG shrimp and grits, steak frites or ravioli with goat cheese, mushrooms, sunchokes and Banyuls cream. Lola and her Butchertown Grocery sibling are probably the only places in town where you can become foodie friends with jalapeño bleu cheese ice cream. You’ll find it on the mixed greens salad that’s embellished with candied pecans. Benjamin’s steamed burger is a nod to his Northeast upbringing, “It’s kind of funny because when I was a kid there were lines out the door where steamed burgers were sold.” Made with prime beef, the burger is topped with Kenny’s white Cheddar and his version of a Big Mac sauce. The Silver Dollar’s slogan is “Whiskey by the Drink.” That tells you something about how much the folks there love their whiskey. Plus call outs from top tier publications around the country show that The Silver Dollar is doing a whole lot very right. GQ magazine ranked it in the Top 10 Best Whiskey Bars in the Nation. “We have such a fun mix of people. There are the young people who are drawn to the liveliness and the more experienced clientele who have a fine appreciation for our more than 300 whiskeys,” says manager Morgan Simpson. Smack dab in the middle of the food menu are house-made pickled items, something you don’t find just anywhere. Here they are pickled chipotle eggs, smoked hot links, smoked trotter and seasonal vegetables. The Chili Parlor offers three types of chilis, while beef brisket, short ribs, fried catfish and cauliflowers teaks make a tasty appearance of Plates. The Silver Dollar doesn’t ignore soups, sandwiches and sides like collard greens, squash and zucchini noodles and smashed red potatoes. 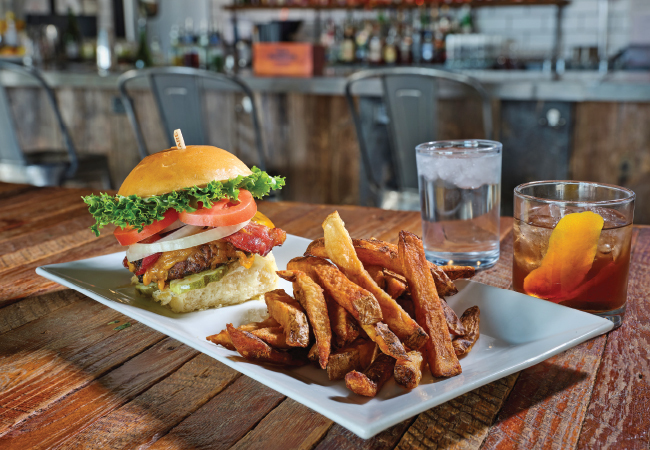 “When coming for late dining, you’re going to find great food and drink and a lot of energy. And you’ll be treated like royalty,” says Bawe Shinholster, Corporate Director of Guest Relations and Quality Assurance at Jeff Ruby’s Steakhouse. Jeff Ruby’s is known for its steaks with a variety of toppings such as white truffle butter, Cognac peppercorn sauce and seared foie gras. 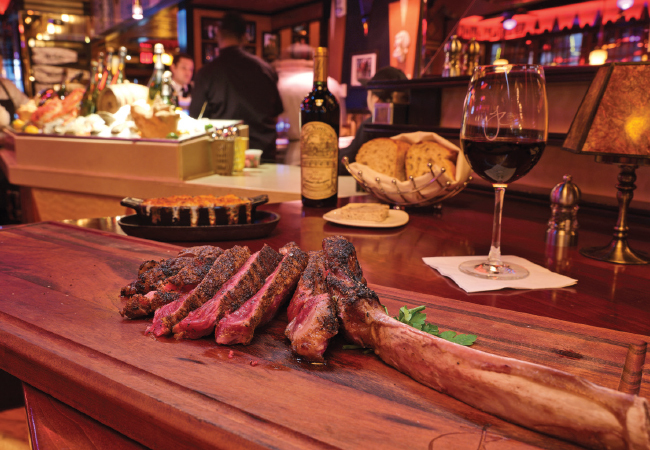 For those who think beef is better when it’s big, really big, there’s The Hatchet, a 30-ounce Tomahawk ribeye. But if you’re not feeling especially carnivorous, you’re still going to be wowed by a menu that features roasted beet salad with blue cheese, hazelnuts and yogurt; crab cakes; oysters Rockefeller; Chilean sea bass and diver scallops. 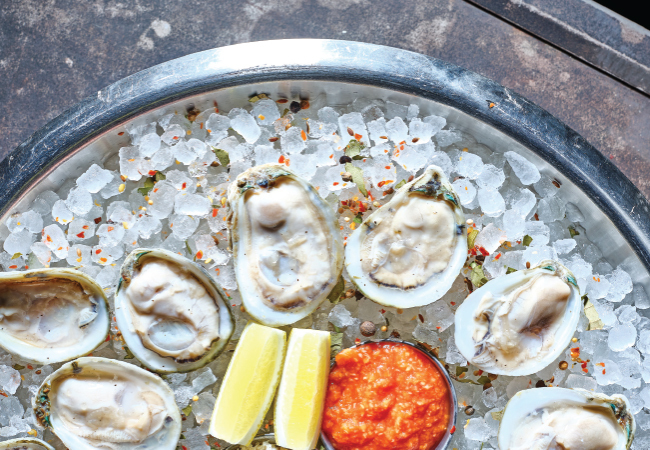 “The raw bar and sushi menu have many lighter items that are fun to snack on late at night,” says Shinholster. When you simply have to satisfy late-night sweet cravings, banana pecan cake, Amaretto cake or pear tart may do the trick. Want to go over the top? The Lucky Cardinal Cake (chocolate cake, white chocolate mousse, meringue buttercream and raspberry sauce) will take you there. If you’d rather sip your finale, Jeff Ruby’s is glad to oblige with a selection of dessert wines, Port and digestifs. “Instead of going to a place where you feel like it’s the last call, here you can have a good time, hang out, listen to live music and dance,” says Shinholster. Let’s get the party started.